It was extremely late when we landed at the sis’s house in Ttown, our plan was to eat and rest before seeing the destruction of an F5 first hand. We were so tired I didn’t even check to see if everything survived driving across Louisiana on I20, not a very fifth wheel friendly road to begin with. After hours of watching the back end of the camper bounce I had envisioned the worst, I wasn’t off by much. It was an avalanche from every cabinet I have in the rig, but all that would have to wait, there were people who needed the supplies and a strong back to help them back on their feet. Driving through Tuscaloosa was a nightmare in parts; I’ve never been able to understand how a tornado picks and chooses what it takes. Whole blocks were wiped out with one house remaining, whole communities wiped from the face of the earth it seemed. We ended up with the sis at Samaritan’s Purse volunteering through them for a day, packing up a sweet couple’s house that was not structurally sound. In fact it was in pretty good shape considering, but then again it was a very old log cabin that I’m sure has survived worse in its day. The second day there we went to deliver food and supplies to the survivors. The women would come up to our truck and ‘shop’ in the bins of supplies we had, only taking what they or their neighbor needed, but always thinking of their neighbors too. Our 5yr old and nephew enjoyed yelling at the top of their lungs “Free Food”, “Hot Food, come and get it”, felt really good to pay forward some of the blessings we have had over the years. 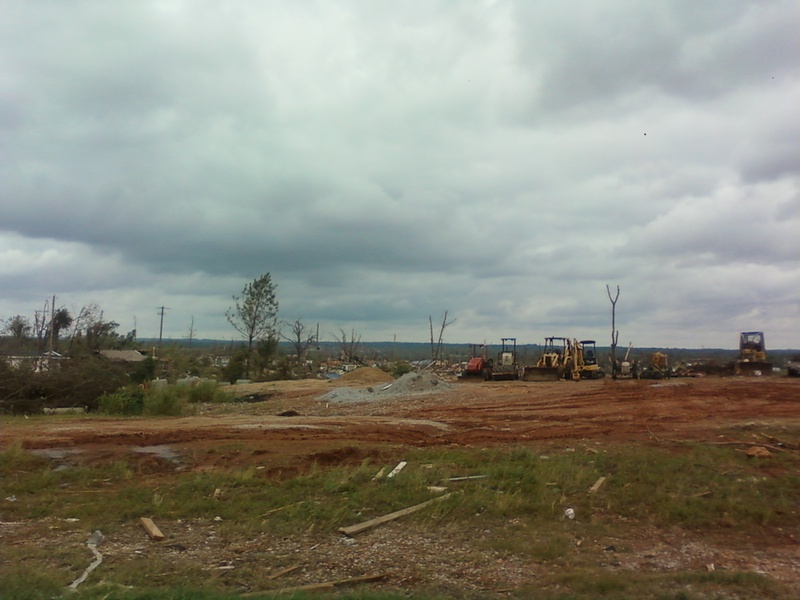 Tuscaloosa was devastated but in pretty good shape considering, they still had half their town standing. On the way up, we took Hwy 43, a very winding and twisting road, up and down hills. All I could remember as I watched the hubby reach 75mph going downhill and around a curve is that truck drivers do this every day and we have full coverage. As we were driving up the only stars in sight were directly above us between the towering pines and oaks that were spared. All of a sudden the sky would open up at what looked like a huge crossroads, only no roads crossing and absolutely no trees left standing on either side of the asphalt. After a mile or so of more towering trees, the skies would open up again, showing the path Mother Nature decided to cut through the forests. Even in the dead of night the small towns and surrounding areas seemed like a war zone, and this was 4 weeks after the storms. After checking with Army Reserves in Hackleburg we were allowed to continue through the town. Every which way we looked buildings were demolished, cars and trucks thrown about like children’s toys. I couldn’t hold the tears back any longer, envisioning what my fellow Alabamians had gone through. My prayers are still with the survivors, still putting the pieces back together. I must stop here and explain why we were so determined to get here anyway, to a town that had nothing left, no infrastructure, running water, electricity, hotels, or restaurants, nothing. You have to remember, in comparison to Tuscaloosa, these smaller towns were ONLY as big as the tornado was. After watching the news and seeing how all the communities and neighbors from all across the state banded together to pick up the pieces themselves, not looking for that handout, we felt as an Alabamian we should be there too, helping. Granted we had volunteers being bussed in from all across the country to help, supplies from all over the USA sent our way, they were people with that same southern hospitality we pride ourselves on. Proud to be from the great state of Alabama!